Prostatic carcinoma is the second most common malignancy in American men and the most common cause of cancer death in men over 55 years old (Catalona and Scott 1978). Although rectal examination is essential for early detection, the diagnosis of prostatic malignancy rests on microscopic examination of biopsy material from the suspicious area(s). Several methods of histologic and cytologic diagnosis of prostatic carcinoma have been advocated. Among these the needle biopsy is the most popular (Catalona and Scott 1978). 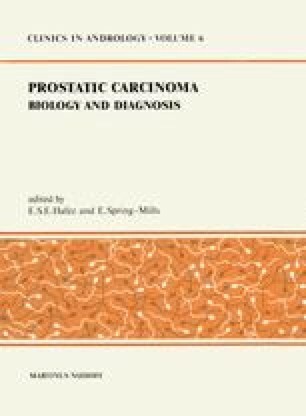 In this chapter, the indications, advantages and techniques of the different methods of prostatic biopsy are described.